Steele has brushed back Rush Limbaugh, threatened moderate Republican senators, offered the “friggin’ awesome” Louisiana Gov. Bobby Jindal some “slum love,” called civil unions “crazy” and promised more outreach to “urban-suburban hip-hop settings” via an “off the hook” public relations campaign. 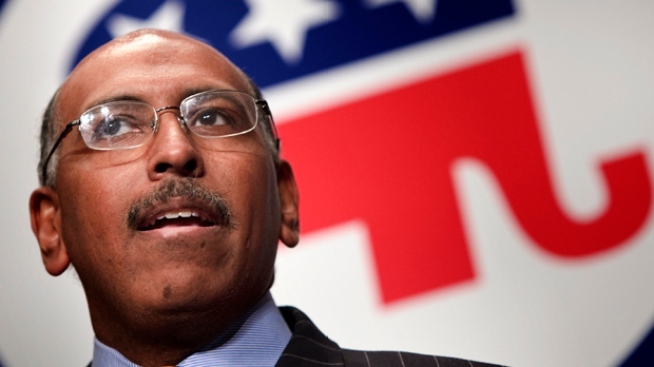 A month after Michael Steele became the first African-American chairman of the Republican National Committee, key party leaders are worried that the GOP has made a costly mistake — one that will make it even harder for them to take back power from the dominant Democratic Party. Steadily becoming a dependable punch line, Steele has brushed back Rush Limbaugh, threatened moderate Republican senators, offered the “friggin’ awesome” Louisiana Gov. Bobby Jindal some “slum love,” called civil unions “crazy” and promised more outreach to “urban-suburban hip-hop settings” via an “off the hook” public relations campaign. That’s in just 30 days on the job — and that’s just the PR part. On the organizational side, Steele does not have a chief of staff, a political director, a finance director or a communications director. Last week, one of the two men sharing the job of interim finance director was forced to resign. For now, “the fourth floor,” as the RNC’s executive suite is known, is being run by a pair of consultants. In a lengthy interview, Steele was unapologetic, referring to the high-level GOP critics and skeptics as “nervous Nellies” and saying that he actually has been tempering his public remarks. Steele said he would make the “hip-hop” comment again — and that when he told The Washington Times that the GOP needed to “uptick our image with everyone, including one-armed midgets,” it was a repetition of a question from the reporter. Doug Heye, a Republican consultant who has worked for Steele, said the chairman uses “common-sense, frank language” that connects with an array of audiences. “He is unwilling to sugarcoat issues,” Heye said. Steele, who has been traveling aggressively since taking the job, says the vacancies at the top of his organization are by design. He said he’s re-examining the whole structure with an eye to streamlining it and will have most of his team in place by the end of March, after he begins implementing reports from transition teams that are planning the party’s own first 100 days. Jim Dyke, a communications consultant to Steele, said: “The public process has raised some eyebrows, and that has some people concerned. But the internal process is actually unprecedented and right on schedule. And when people find out about it, they are going to be very pleased." A 50-year-old lawyer who likes to call himself a Lincoln Republican, Steele was lieutenant governor of Maryland from 2003 to 2007, the first African-American elected to statewide office in the heavily Democratic state. After leaving office, he became a Fox News contributor, and became chairman of GOPAC. Born at Andrews Air Force Base, Steele attended a Catholic high school in Washington and graduated from Johns Hopkins, then spent three years in seminary preparing for the priesthood before switching to Georgetown Law. At the urging of top Republicans, he ran for U.S. Senate race in Maryland in 2006, garnering a respectable 44 percent of the vote. But this kind of “different” is making some party leaders extremely nervous. “I’m worried that we need someone to manage the chairman,” said one frustrated Republican National Committee member. Other party leaders have voiced similar concerns in private conversations, but they’re wary of taking on the chairman so early in his tenure. In an embarrassing soap opera that unfolded this week, Steele took the bait from Democrats who were trying to make Limbaugh the face of the Republican Party. Steele first seemed to criticize the radio host in comments aired Saturday night on CNN, referring to him as an "entertainer" and "incendiary." But when Limbaugh roared back about the “sad-sack” state of the party and said that Steele was “off to a shaky start,” Steele backpedaled, telling Politico he had been “inarticulate” and saying he had not been trying to undermine Limbaugh. That emboldened the opposition, with Democratic National Committee Chairman Tim Kaine, the Virginia governor, calling the apology proof that Limbaugh is "he who must be obeyed" in the GOP. Back at headquarters, Dyke said the transition teams are reviewing all the party's big functions -- communications, political, administration, technology, strategy. “Their task has been to look at every line item in the budget, every organizational chart, every position, and recommend a structure and a mode of operating that reflects the necessary change to meet a new campaign environment and a minority status without control of the White House, House or Senate,” he said. Steele has begun his makeover of the bureaucracy, moving the “coalitions” operation — which helps mobilize interest groups such as small businesses, farmers and Hispanics — out of the political department and turning it into a department of its own.